There are times when I feel my babies’ presence more than others. They come unexpectedly, sometimes they are moments to smile and just feel close to them, like they are letting me know that they are okay, they’re in Heaven and having fun cloud surfing or something. Other times they hit me like a ton of bricks and I’m left trying to pick up the pieces before anyone notices that I’m not okay. Maybe those sad moments are the ones that come from my insecurities or my jealousy. Maybe it’s just the nature of grief to have happy nostalgic moments and sad moments and you never know what you’re going to get. This last miscarriage has been the hardest. I kept asking Austin if I was like this with the other two, sad, numb, uninterested in life, feeling like I’ll never get better, not knowing if I want to get better. He said I was, but I didn’t believe him. I must have blocked out those first months after the other two because I don’t remember. I should always belive him. This week I realized I feel better. I’m beginning to remember who I am. I’ve had more good moments than bad. In fact I can only think of one bad baby moment this week and I was feeling so good that the sadness surprised me, caught me off guard. I love those sweet babies so much, I loved my moments with them. I didn’t have many, but they were the best moments of my life. Telling Austin he was going to be a daddy for the first time, seeing that first baby on the ultrasound screen, feeling so strongly that the second baby was a girl, feeling like she was a promise of good to come, knowing without a doubt that I was pregnant the third time and just waiting for it to be long enough that a test would come back positive, feeling morning sickness for the first time with the third, telling Walt (our cat) he was going to be a big brother and having him jump up on our laps and “head boop” us. They aren’t all regular moments of pregnancy but they are precious to me – they’re all I have. Life is made up of moments. I am feeling better, I am getting back to who I was in a way, but I’ve also changed again. Each baby made an impact on my heart. Each baby changed me. So while I get back to who I was, I am yet agin figuring out who I am now. Becca Toews, mother of three babies in heaven. Today is the day we remember. We remember the joy of seeing that positive pregnancy test, the excitement of telling the precious few our exciting news, the adoration as the weeks passed and we fell more and more in love with our little ones. Some of us remember first ultrasounds, even second or more ultrasounds, seeing a heart beat, seeing the baby grow. Morning sickness, exhaustion, cravings, we remember it all. And we remember most of all – love. 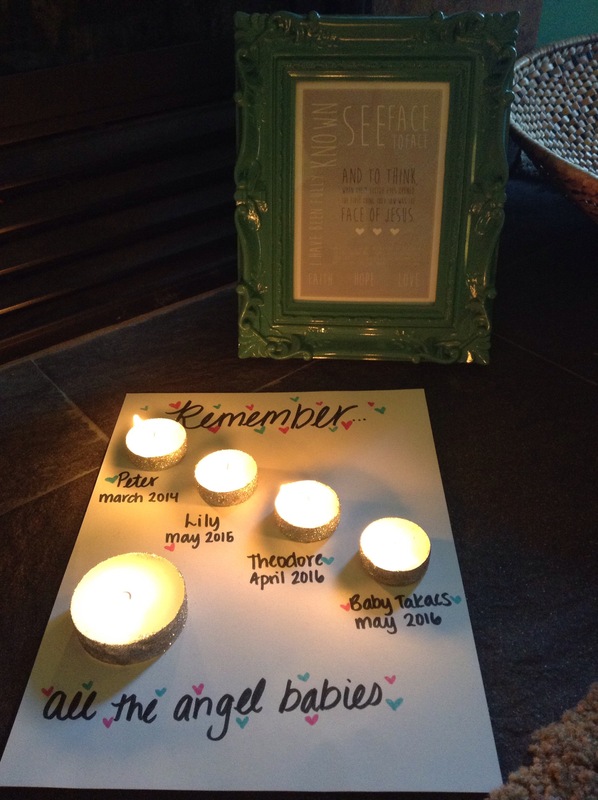 Today we lit candles in remembrance of some special Angel Babies. Our three, Peter, Lily and Theodore and for Baby Takacs who just went home to Jesus this past weekend. We also lit a candle for the rest of the babies, the ones we don’t know about, the ones we do know about, all the babies lost too soon, before their parents ever got to hold them and know them. This month is Pregnancy and Infant Loss Awareness month. So often couples are grieving in silence because they feel they can’t talk about it. We are bringing light to the grief. 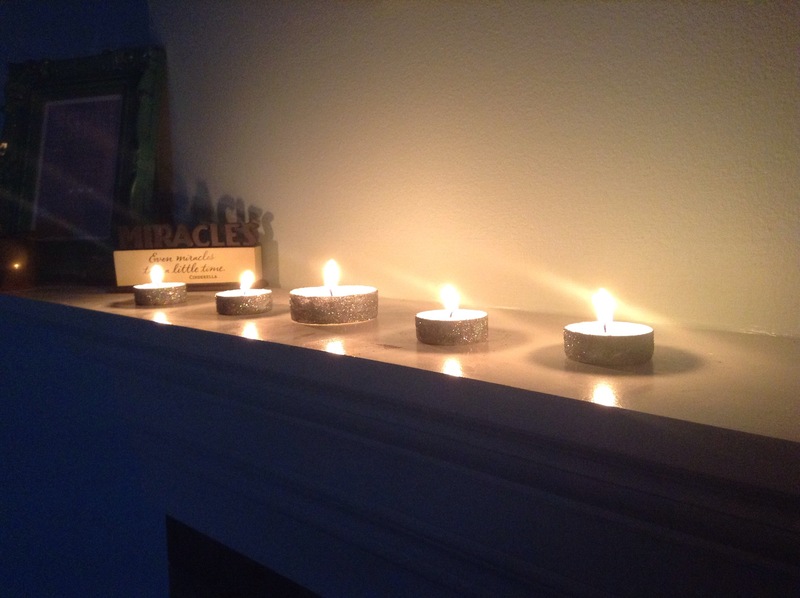 We are lighting candles. We are remembering. Thus begins Dumbledore’s speech to give Neville ten house points for standing up to his friends (if you haven’t read The Harry Potter series, I highly recommend it regardless of your age, it’s fantastic). You are facing a mountain dear Mama. 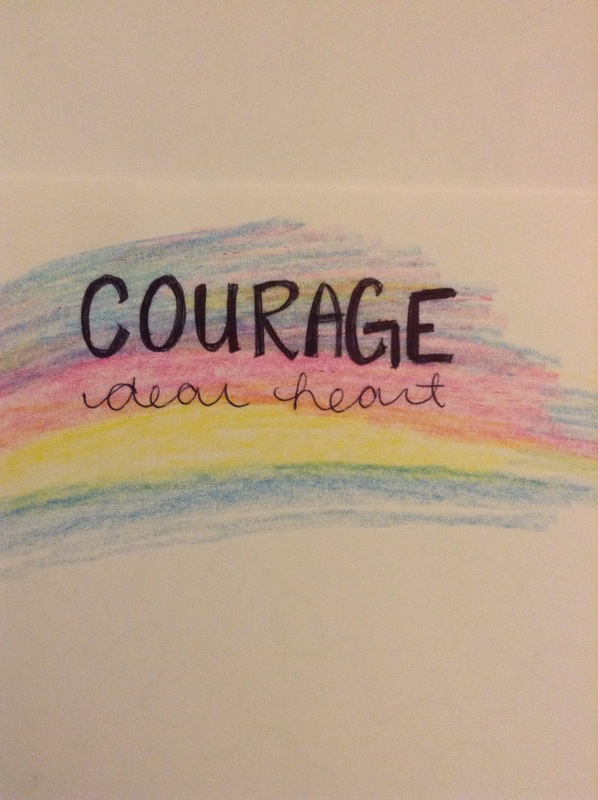 Courage will look different each day. Some day it might be telling your story. Some day it might be trying to conceive again. Some day it might be talking to your partner about the next step. I’ve had days where courage has been just to get out of bed, or shower or go to work. All I can say is, you get to decide what your brave is. Take your time, lean on those you love, find someone you can trust, celebrate the little things – the first time you wash your hair, put on make up, make a meal. Know that you are brave, just by going through this. I am so sorry to welcome you to this sisterhood. It is a club you never want to join. Days or weeks or maybe even months ago you were sitting in your home looking at an at home pregnancy test, or sitting in a doctor’s office hearing the good news and you were happy, and now you find yourself here. Maybe you are hoping for answers, I’m sure you are looking for comfort and I am here to say, no one should go through this, I’ve been where you are, in fact I am where you are for the third time in two years. I can’t tell you what you are feeling but I can tell you to let yourself feel it. Sadness, anger, pain, frustration, hope, hopelessness, all of it. It takes time. Lots of people are going to tell you lots of things (if you decide to share your grief). Know that they are trying to help, know that you can take it or leave it, know that you get to guide your journey through this. My dear you are a mama. For however long that little life grew in your womb it made you a mama. Over the next weeks or months or maybe even years you are going to go through lots of thoughts and feelings and I hope you have people you can talk to about it. If you don’t (or even if you do) I am here. These pages will be filled with my story, with my days and my feelings, my ups and downs and maybe (eventually) your stories too. This is a place of support, of love, of sisterhood. One in four pregnancies end in a loss (miscarriage or stillbirth), here we can support all those “ones”. I am one in four, and I am here for you.